While the digital discussion remains top of mind in the communications space, traditional methods continue to make a significant mark when transmitting the overall corporate message to a remote workforce. While the digital discussion remains top of mind in the communications space, it's important that traditional methods continue to make a significant mark when transmitting the overall corporate message to a remote workforce. Iron Mountain, a global records management company, employs 8,400 employees in North America, which includes nearly 6,700 non-networked, front-line workers. Beyond North America, the Boston-headquartered company provides services such as information destruction and data backup to approximately 120,000 customers throughout Europe, Latin America, and Asia. The constant challenge, says Mary Hettinger, Iron Mountain's director of North American employee communications, is delivering consistent messaging to 1,000-plus locations, which are mostly warehouses and shred plants - not offices - with about 25 or fewer people on-site. Hettinger heads a team of three solely dedicated to employees based in North America, where she says their initial focus is about shaping a positive perception of the company within their employees' minds and then mobilizing that mindset effectively. "We're not only trying to shape employee perception, we're looking to influence their behaviors or actions so that what they're doing really aligns with the company's goals," explains Hettinger. "You can have employees who are very engaged, very proud of where they work, but if their energy is not lined up with where the company wants to go, it's wasted." Since much of Iron Mountain's workforce does not have access to computers or the company's Intranet, Hettinger says it's up to "good old-fashioned tactics," including mailings, a printed newsletter, and face-to-face meetings. The company has also begun experimenting with videos, which are hosted online, and then shown via managers' computers during "team talk" meetings. Right now, Iron Mountain is undergoing an audit of its internal communications methods. It is also looking into newer tactics, such as handheld scanners and on-site kiosks, Hettinger adds. Airlines are testing the effectiveness of arming remote workers with handheld electronic devices. 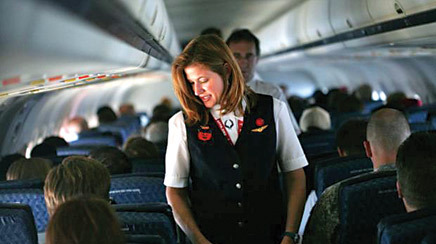 For example, a flight attendant can bypass paperwork and more quickly file a maintenance request via PDA. American Airlines is experimenting with pushing information via iPads to pilots in-flight. There are downsides, though, says Weber's Paul Jensen, including IT costs to maintain and support devices, the work-life balance debate, and privacy. "You're relying on trusting your employees more to treat data as proprietary," he adds. "Companies must adopt guidelines and employ IT strategies to ensure privacy and security. They need training, as well." Nearly 70% of employees for many companies, such as Iron Mountain, do not have email addresses, says Paul Jensen, Weber Shandwick's North American corporate practice chairman and New York GM. "While social media is tremendously important for business, in this particular sector traditional channels are not to be overlooked," he tells PRWeek. Media relations is also vital in the space. "Several companies with remote workforces have done employee surveys," adds Jensen, "and the media is viewed often as the most reliable and trusted source, so a strong program is key." Meanwhile, communications training for line managers should be another significant slice of a remote workforce strategy. "Communications often gets stuck in the middle," says Jensen. "It gets successfully pushed out to line managers, but frequently does not successfully cascade down from a line manager to the personnel on a factory floor, in a retail store, or a maintenance worker on a plane or delivery truck." At American Airlines, messaging needs to be communicated to 50,000-plus front-line employees who do not have access to email. The company created local joint communications task forces at airports and maintenance bases, made up of management and non- management, union and non- union, employees, says Susan Gordon, MD of corporate communications. "Because they are local, these teams know and understand their business environment," she explains. "They're closer to their audience. They know how to reach their colleagues and how to plug into the rumor mill. We develop the companywide messages and then we create almost syndicated articles we can pass over to the departmental communicators, and they can then take, shape, and customize for their particular vehicles."